Bell bottom and Platform shoes - the 70s are back! What is trending this Spring and Summer!? Get your bellbottoms and platform shoes on, because the 70’s are back in a big way! We can’t resist the calm and welcoming demeanor of woven textures, warm earth tone velvets, and natural wood tones. Here are some looks that we think you will love, including lights, rugs, and seating options. All of these pieces can be found at HOME by Stamm & Black. Just ask one of our four designers! We are incorporating rattan in some of our designs, as it is primarily a light and “airy” use of wood and is great for small spaces. Whether it’s a fixture, window treatment, occasional stool, or the focal point of a room, we can’t get enough of this warm natural look! Baskets and pot holders are another way to accessorize any space for those on a budget, while still attaining a similar look. So, let that inner boho out and get weaving! Although we still have the doors propped open at the store some days, and we are enjoying every last bit of warmth and sunshine, there and more and more people coming into the store with winter hats and coats on and it is time to face facts. Ready or not...the holiday season is officially upon us! The good news?? We are ready for you shoppers! 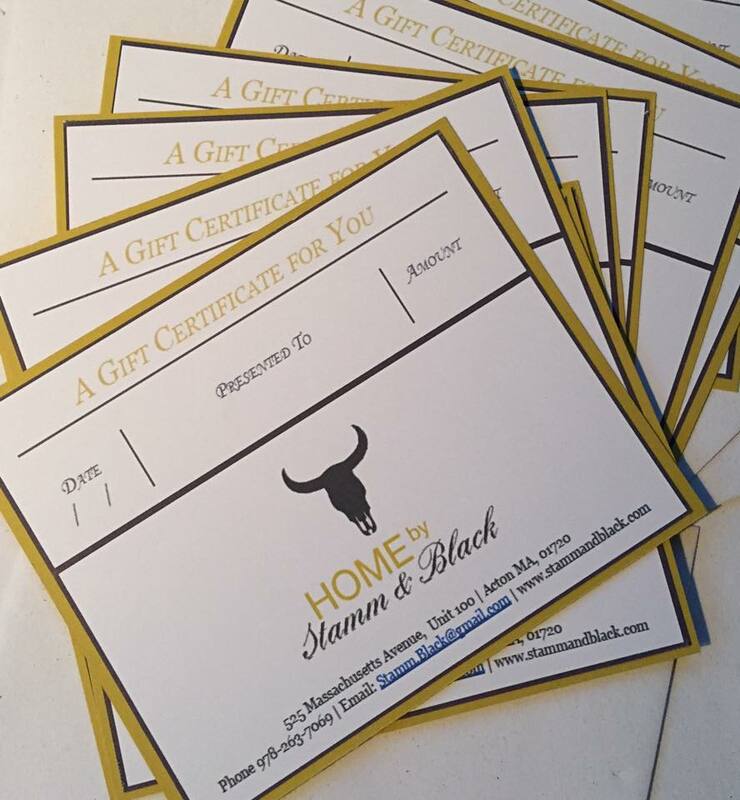 HOME by Stamm & Black is now full of gifts that will make your friends and family smile when they receive them! If you are traveling for the holidays, don't show up empty handed - we have hostess gifts galore! Hosting this year or need extra seating, lighting or accessories for your home? We have those too! Stocking stuffers and Christmas ornaments? We have baskets of goodies all over the store waiting for you. In an effort to help you get your holiday lists organized, we would like to offer you our Holiday Gift Guide. This is a perfect way to figure out what to buy for others, or what you would like yourself! Feel free to share the list with people who are buying for you, and would like some guidance! Gift giving is not supposed to be stressful! We hope you enjoy our gift selection, and if you have any questions, please feel free to call the store 978-263-7069 or send us an email: stamm.black@gmail.com. Light a candle by Aria Botanicals this holiday season and fill your home or a loved ones with scrumptious natural scents. 100% Soy. Cleaner burning, and lasts 35% longer than regular wax candles. Want to cuddle? We have cotton blend throws that are so soft you will never want to leave home! Locally made gourmet foods - honeys, jams and baking extracts. Add locally sourced ingredients to your cooking and baking this year or give as a gift for a loved one. Cathryn Violet Artisan Soap - locally handcrafted in small batches, with essential oils blended to perfection. This soap is a must! NEW to the store - JESSI + CO!! Locally made, minimally processed, natural products made in small batches that lift your spirits and nourish your skin. Body butter, lip scrub, or repair salve anyone? Lastly, our private labeled "Stamm & Black" body products will keep your skin hydrated all winter long - bubble bath, perfume, body or hand lotions. Art is a very subjective thing, but if you really know the person you're giving to this year, art is something that will last a lifetime. Paintings and ceramics - there is something for everyone! Pass along the gift of creativity to the little folks in your lives - locally made BLOX IN A BOX are handcrafted blocks that can be passed on from one generation to the next! Side tables, lighting, extra seating, locally sourced cutting boards, votive holders, rugs, trays, succulents, furniture or even a custom herb wall garden are all available to you this year. There is nothing better than a beautiful home and family to share it with this holiday season! We always have gift certificates and locally made holiday cards for the local who may want to come in themselves and pick out something fun! Our hours this holiday season are Wednesday – Friday 10-5pm, Saturday 11-5. We will have some extra store hours as we get into December so stay tuned AND THANK YOU! 10% OFF ALL DASH & ALBERT RUGS! We offer rugs from a variety of companies, and one of our top sellers is Dash & Albert. Dash & Albert creates fresh and fabulous area rugs for every floor, in cotton, wool, indoor/outdoor polypropylene, jute, sisal & more in hundreds of patterns and colors. Check out the Dash & Albert website - it is extremely user-friendly! Sort by color, material, or size and find the perfect rug for your home. At HOME by Stamm & Black, we are happy to pass along our designer discount and order the rugs for you! OUR PRICES ARE ALWAYS 10% LESS THAN THE DASH & ALBERT WEBSITE. Find the rug you'd like (or we would be happy to help you find the right one), let us know the size you'd like, and we will find out availability, order your rug, track and notify you when it arrives at our store! Ship to our store and pick up, OR we can have them ship directly to your residence. Your choice. Look around your home. Do you need to add or change a few things, but don't need the full interior designer experience? We can help! Our Retail Manager, Amy, offers a complimentary shopping service for all our customers! The perfect pieces for your home are out there, but maybe not where you are looking! Whether you are looking for a side table, a mirror, wall clocks, new dining room chairs, rugs, accent pillows, or cabinet knobs...we have access to hundreds of designer 'to the trade' resources ... and are happy to share our finds with YOU. Stop in at HOME by Stamm & Black or email us with your wish list (include information we may need such as dimensions, color, other preferences). We will be in touch via email, and send back images of pieces that you may enjoy within your specified budget! All items will be shipped to our store and can be picked up when they arrive OR delivered to your home for a small fee. We know you are busy, but that some of you like to do your own design work. We think that's great! With your eye, and our resources, we can make your house a home one piece at a time.